I originally tried this dish at Alamo Springs Cafe outside of Fredericksburg but found the recipe everywhere online. I am going to have to force myself not to make this everyday-it is great for every occasion. To make crostini: slice baguette into thin slices, place on a foil-lined baking sheet, drizzle with olive oil and sprinkle with salt and pepper. Bake for 7 minutes then turn over and bake for 5 minutes. To roast the garlic: Slice off the top part of the garlic (the thin top) so that the garlic cloves are exposed inside the peel. Place 1/2 tbsp of butter on top of each head of garlic. Place buttered garlic face down in a small baking dish coated with cooking spray. Cover with aluminum foil and roast until garlic is browned and soft...about 30 minutes. 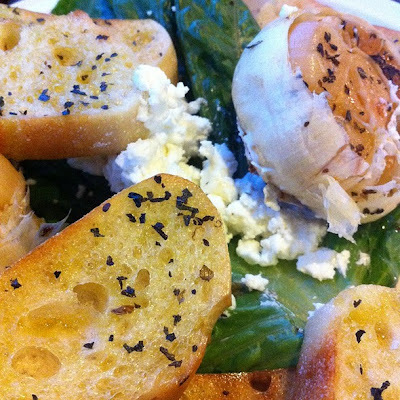 To serve: Spread goat cheese on crostini, then dig out a garlic clove and spread it on top. Voila. Photo my own, recipe from The Avid Appetite.